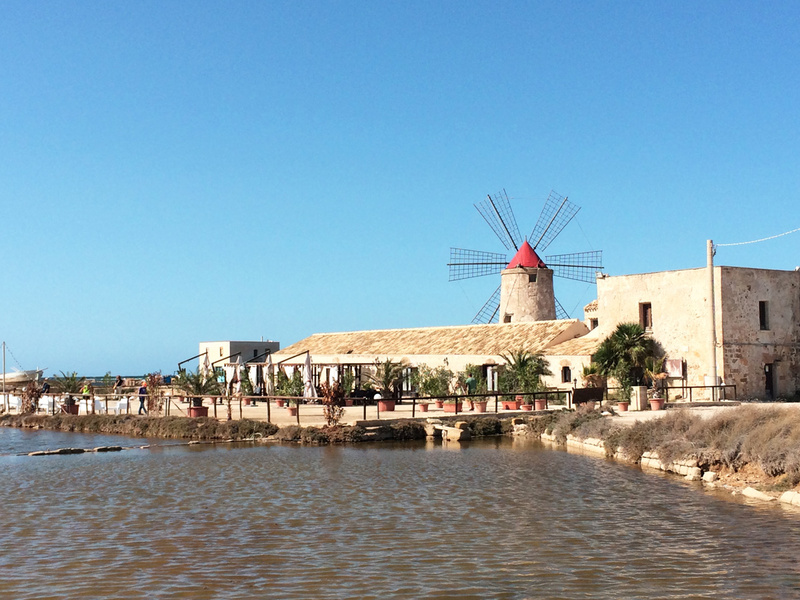 Salt, windmills and pink feathers: traditional sea salt harvesting in Sicily. Salt: the one ingredient you can find in just about every recipe you’ll ever cook is probably the most overlooked, but have you ever wondered where it comes from? As Soup As Possible travelled to the West coast of Sicily, to discover how salt-winning has been shaping the natural landscape in harmony with wildlife for over two thousand years. The only rock that made it to possibly every cuisine in the world is so invisible on our plates that we tend to forget about its incredible value. Contributing to fundamental physiological functions, such as the regulation of blood pressure, nerve system, muscles and digestion, salt is vital to organisms, just like water. Likewise, it needs to be sourced from nature: animals cannot produce it on their own. In style with Nature’s proverbial creativity, this need has generated different responses. Goats lick salty stones, whereas we humans have slightly more sophisticated preferences when it comes to assuming salt, but the juice is the same: we animals need to supplement our diet with a small amount of this mineral compound to survive. A human body of 50kg contains about 75 grams of it and will tend to maintain that amount. Whether you fancy calling it sodium chloride (NaCl) or simply table salt, you need a minimum daily intake of 3 grams of this substance to stay healthy. A sodium deficiency can lead to malnourishment and symptoms like nausea, fatigue, hallucinations and convulsions. Our salt consumption fist increased in Neolithic times, when our ancestors progressively shifted from hunting-gathering life to agriculture. While raw meat had been the main source of sodium that far, a diet that included an increasing amount of grains and other plant-based foods called for additional salt to ensure a healthy intake. This is why most human civilizations were born in the vicinity of salt sources and developed a fascinating variety of salt-winning techniques, all labour-intensive and requiring complex tools and management structure. Possibly one of the first goods to be traded, salt made history. It left its mark in place names, idioms and customs all over the world. The Roman road called via Salaria – built to connect ancient Rome to production plants on the Adriatic coast of Italy and still in use to this day – was the only main trading route named after a good rather than the consul who ordered its construction. This should give you an idea of the importance this commodity had in ancient history. The next time you see shakers on every table of a cheap eatery, remember that salt was once as precious as gold and sometimes synonym with money. The word salary derives from salarium, which comes from sal (salt) and indicated the wage of Roman soldiers. Some tribal cultures even used salt as a currency. Through the centuries, salt has been at the center of insurrections, wars, trade rivalries and revolutions. From ancient China to medieval Italy and Gandhi’s India, salt taxes, or gabelle, were imposed by governments and colonial rulers, and shaped economies, power distribution and cuisines. Bread in some Italian regions, for instance, wouldn’t be traditionally unsalted if not for the gabelle imposed by the Papal State in the Middle Ages, and the protests that ensued. Depending on the sources available, there are three main salt-winning options. Solar Evaporation: in coastal areas, salt is harvested from the sea, by conveying sea water into shallow ponds, or salt pans, to facilitate the crystallisation of the mineral compound. This method requires the right environmental conditions, first and foremost that evaporation exceeds precipitation. Salt pans along the Rhône River Delta, France [Photo: NASA Earth Observatory, 2018]. Mining: inland areas that can not rely on renewable salt sources like the sea, can sometimes gain access to underground salt beds resulting from the drying up of enclosed bodies of water. The extraction takes place through regular mining techniques and the product needs to be crushed down and possibly refined in case of impurities. Solution mining: also based on underground rock salt reserves, it consists in injecting water down a well and into the ground. The crystals are thus melted into a brine, which is then extracted, boiled down to a dry mineral deposit, and finally purified. Underground rock salt – also known as halite – formed over million years from ancient seas and is, therefore, a finite resource. Solar evaporation, besides being the oldest salt-winning technique, represents the method with the lowest environmental impact and carbon footprint, particularly where the harvest is still performed manually. Salt evaporation pads have marked the landscape of the Trapani area, on the West coast of Sicily, for thousands of years. The first civilisation to have taken advantage of the ideal conditions of this part of the island – flat, windy and sunny coast – is believed to have been the Phoenicians. Sea salt has been extracted here for thousands of years, though a particular system of interconnected artificial water pools. The beautiful windmills that overlook the salty lagoon were once used to help pump the water from a class of pools to the next. The gesticulate vanes of the windmill would be covered in sales and maneuvered by a specialised worker who would turn the swirling top of the mill to catch the best wind. The knowledge required to attend these windmills are unfortunately lost forever, but until a few decades ago they were part of a very specific set of skills that allowed small teams of hard-workers to carry out the work in the saline (salt plants). The salt production here was very relevant until the Sixties when the competition of industrial salt mining became too hard to beat with the costs of artisanal production. The restructuring of labour led to some sacrifices, but after a few decades, Trapani sea salt regained its name. Slow Food presidium protects its status as a sustainable and traditional product. Nowadays the windmill operator is no longer there, but teams of competent salinari are still at work during the production season, managing the water pans and harvesting the salt at the end of the Summer. It takes some specific knowledge and hard work to crack and harvest the hardened surface of crystal without scraping the underlying layer of clay, but it’s worth the effort. The final product is pure by nature and, unlike the salt that’s harvested by automated processes, does not need further refinement nor the addition of iodine. On my Sicilian mission for As Soup As Possible, I met Irene Culcasi, who belongs to one of the few families of entrepreneurs who still produces whole sea salt in the most natural and traditional way, which – by the way – happens to be the most sustainable too. It’s not by chance that the area where the Culcasi’s and other ancient salt flats are, between the beautiful towns of Trapani and Marsala, is also a natural reserve and a bird sanctuary managed by WWF. Irene is a competent young woman, proud guardian of her family heritage and animated by a deep passion for education around salt making. She and her brother run a small Salt Museum, within the beautiful XV century windmill within Saline Culcasi. The museum was established by their grandfather, in collaboration with local authorities, to help educate visitors about this ancient local tradition. In 2011 the European Commission added the name “Sale Marino di Trapani” in its list of Protected Geographical Indications (PGI). To use this name, salt needs to be produced in the area between Trapani and Marsala as per tradition, that is with no additives, bleaching or anti-caking agents. Irene met me before the golden hour, just after her last guided tour of the day, to tell me more about Trapani sea salt and its romantically wild birthplace. Sweet sunsets and salty flamingos. If you visit Trapani’s saline at the end of the summer, you will definitely come to the realisation that flamingos are born greyish. These beautifully eccentric birds stop and reproduce in Sicily during their migrations. Their feathers gradually turn pink as an effect of their diet during their stay at the sea salt fields. Some of the innermost ponds are not a welcoming environment for most microorganisms due to their high salinity. However these habitats have their evolutionary champion: a micro-alga called Dunaliella salina, that developed a coping mechanism to survive those extreme conditions by producing carotenoids. As a result, the water turns orange-pink, making sunsets on the lagoon even more spectacular and the flamingos that graze in it …pink as they should. The presence of flamingos and other wild birds is the living proof of the success of the WWF sanctuary that protects the area. It also showcases the wonderful balance that traditional sea salt production helps maintain between human activity and natural environment. Although for most of us salt belongs on dining tables, its main role in pre-refrigerator times was the preservation of food rather than the enhancement of its flavours. With its property to capture water molecules, salt can starve microbes. This allows the preservation of food for many months or even years. A useful application for this property is the ancient practice of curing meats to store and transport them safely. The link with salt can be easily found in the Italian word for cold cuts, salumi – of which salame is probably the most famous example. Both terms come from the Latin word sal, that indicates both salt and seawater. Likewise, many other terms that we use to this day – like salad or sauce – bear the traces of their link to salt. Our precious pantry rock is indispensable in the kitchen. Saltiness is one of the main tastes and we have specific receptors for it even five starred chefs would be lost without this humble mineral. Saltiness interacts with other tastes in surprising ways that go beyond a simple boost of flavour. For example, a pinch of salt added to sweet foods enhances their sweetness, whereas if you use it on bitter foods the edges of the bitterness will be smoothed out and your tasting experience will be much more pleasant. Of course, the topic of salt as an ingredient alone would call for a whole new article. For now, I’m content if I have managed to give you a taste of the many stories a grain of salt can entail. Previous PostChocolate Easter eggs workshop. 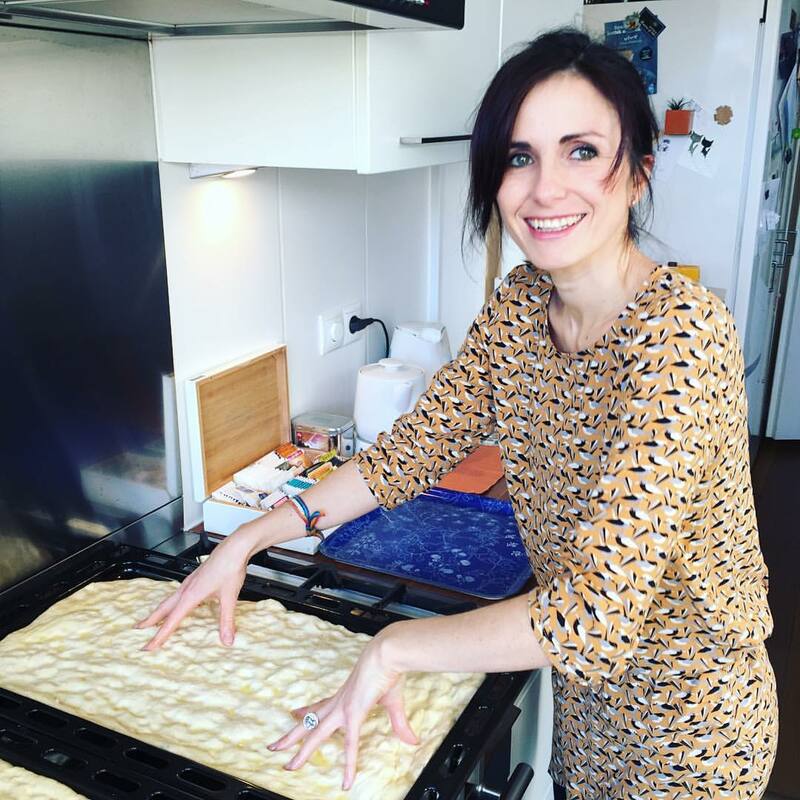 Next PostPiadina Romagnola, Amsterdam version: an expat recipe.